Messonghi Paradise is a unique holiday house that sleeps 10 guests, located in Messonghi Beach resort with direct access to the beach right in front of the mansion for the exclusive use of the guests. Messonghi Paradise is a unique holiday rental property that can accommodate 10 guests with the option of an additional person. Messonghi paradise is located in the popular Messonghi Beach resort with direct access to the beach right in front of the mansion for the exclusive use of the guests. Messonghi Paradise is a 280 m² mansion with 2 floors which is set in a 3,000 square meter land, surrounded by private-gated property area with olive groves. Its unique private beach is ideal for swimming, sunbathing and also having a romantic walk on the beach. It is also ideal for having a dreamed marriage ceremony in the mansion's private premises and vast gardens. This traditional 280 m² mansion was refurbished in 2011 and is ideal for couples, wedding ceremonies and galas, families or even a group of friends that require exclusivity and privacy. The mansion is located in the traditional village of Messonghi beach, approximately 18km, conveniently equidistant south of Corfu town, the Airport and Corfu town port and north of Lefkimmi port, alike. Messonghi is a small yet lively fishing village that ideally combines beauty and relaxation with modern and lively options. Guests have a selection of restaurants, traditional fish taverns, beach cafes, bars and clubs (these are especially active and lively in the neighbouring Moraitika Village). Super markets (groceries stores), pharmacists and local medical clinics are a short walk down the road. The mansion is located at the south boundaries of Messonghi, ideally located for quiet nights overlooking Messonghi beach bay, yet only on a walking distance from the village centre and the beach action. The fantastic sandy beaches of the island’s unspoiled southwest coast are only 10-30mins drive away. Make sure you don’t miss the idyllic cedar covered dunes of Issos beach (9,5km), Chalikounas beach (9,6km), the scenic Marathias beach (15km), and the mystic and undiscovered Arkoudilas beach (30mins). Cosmopolitan Glyfada (28km) and Pelekas (24km) are around 50mins drive to the north of the island. The famous Achilleion palace is only 12km from the property. The traditional Corfiot village of Chlomos with its stunning views overlooking both the Adriatic and the Ionian Sea is only 5,5km away on a breathtaking scenic drive over the mountain. 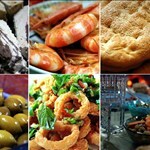 Famous fishing village Boukari with its various selections of fresh fish taverns is only 5km to the south. Lefkimmi port with its regular boat services to the neighbour “exotic” beautiful islands of Paxos and Antipaxos is 24km away. 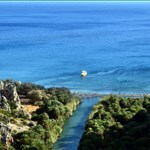 Famous and historic Corfu town is 23km from Messonghi Paradise. 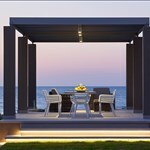 Messoghi Paradise can accommodate up to 11 guests in 5 bedrooms, providing 3 double beds, 4 single beds and a sofa bed. This holiday home is equipped with 3 bathrooms, dining space with a double-faced fireplace, outdoor BBQ and a large fully equipped kitchen. Bedroom 5: is actually a Studio with Kitchenette, Fridge and a small Bathroom. The Studio has its own entrance and it is not connected with the other bedrooms.